The year was 1958 and I was seven years old when I first met my Momma. It’s not important how we three children fell into the child-care system, nor how we came to live at that orphanage. Simply stated, the man our birth Mother had run off with didn’t want to raise three hungry children after she was killed in a car accident. So there we were. I vividly remember holding each sister’s hand through a chain link fence: separated on the boys’ and girls’ sides. It remains important that we three children stayed close. One day they got us all “fixed up” and took us to the courthouse to see the Judge. To insure good behavior, the social worker gave me three pennies for the gumball machine… “if we were good.” When we arrived they walked us right past the gumball machine and, to our great joy, into a room with our biological Dad. The Judge told me, as the oldest, that if I wanted, we could go with our Dad and the new Momma he had for us. Somehow she understood I meant a different kind of question. She replied, “Yes Honey, I will.” I turned to the Judge and told him we would go with her. For the next twenty-five years she cooked and cleaned and slung hash at the Calico Kitchen all night long only to come to three more hungry mouths. She wasn’t perfect, I don’t know anyone who is, but she raised and reared us when necessary. Finally, we were all three out of the house and married and raising families of our own. Life was good. Then Dad chose to leave with another woman. We kids were devastated. I wanted to show Momma my support, love, and appreciation for all her gifts and sacrifices. I wrote her a letter and told her that no matter what happened or what anyone else in the world did, she would always be our Momma. To emphasize my point, I taped three shiny new pennies into a card and sent it to her. That was fifteen years ago. Momma died this spring, we buried her on Good Friday, but because of her, we will never again be motherless children. As we sorted her things out, I opened her jewelry box drawer. 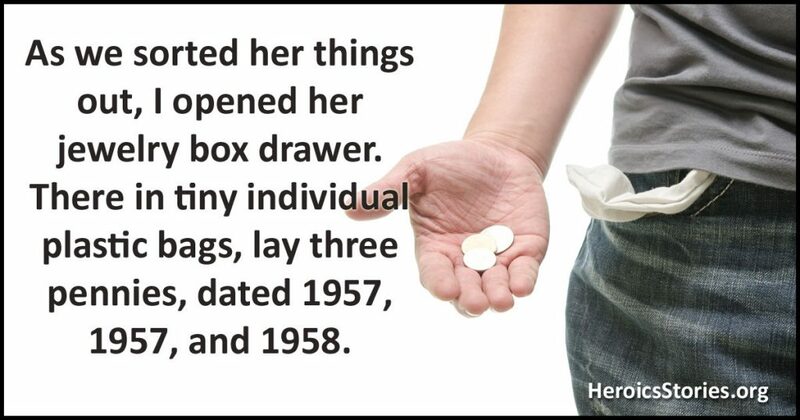 There in tiny individual plastic bags, lay three pennies, dated 1957, 1957, and 1958. I have them in my pocket at this moment. No one will ever make a movie or write a book about her, but to me and my sisters, she is the world’s best Three Penny Momma. This story is so amazing. It warms my heart to know that there are still good people out there will to raise someone else’s children as their own! A beautiful but also sad story of love and lost love. But love prevailed and weaved itself through the lives of those 3 sisters. Great story, I Really enjoyed it. I wish I had the Same. We all long for a Good Mother and I’m Happy for those Who Do!